Crispy. Chewy. Cheesy. Oh, and BACON! Of course bacon. An everyday, ordinary breadstick is transformed into an extraordinary indulgent appetizer. 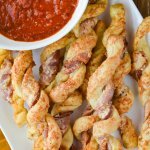 When these twisted Cheesy Bacon Wrapped Breadsticks are dunked in your favorite marinara sauce, they’re not only brought to the party, they then become the party. My philosophy – anything can go from good to GREAT just by adding bacon to it. Since I’ve been on a bacon kick lately I’ve wanted to include it with anything and everything. 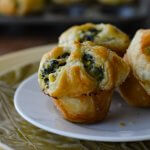 I thought I would make the perfect football finger food for a Super Bowl Party. So … here ya go. Cheesy Bacon Wrapped Breadsticks. 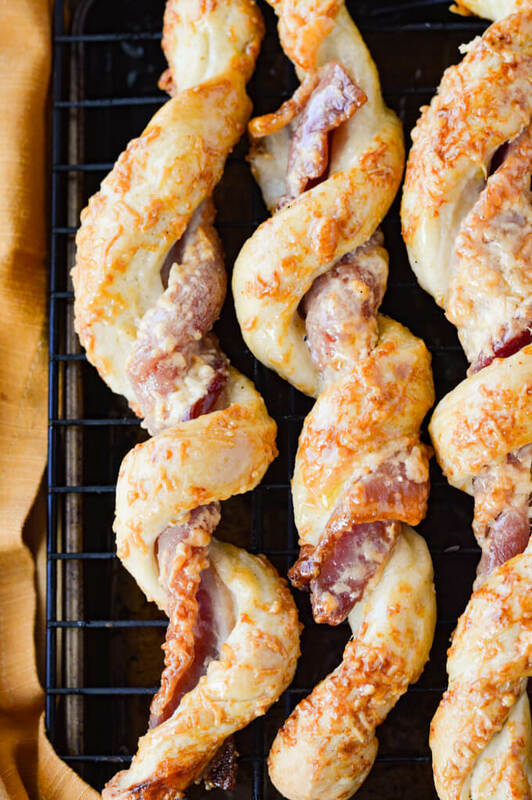 They’re just plain fun, never boring – the twists and turns of bacon and breadsticks. Sometimes you just want something that not only tastes great but is fun on the platter. I know … that sounds silly. But these appetizers are much more entertaining than a dull tray of raw veggies and ranch dressing. The bread dough is versatile. With the same dough, you can cut it in strips and whip up these breadsticks or you can add your favorite toppings and make some pizzas. But if you’re really ambitious, you can do both. And why not, there’s a party happening? Once the dough is rolled out, these appetizers are super easy to pull together. 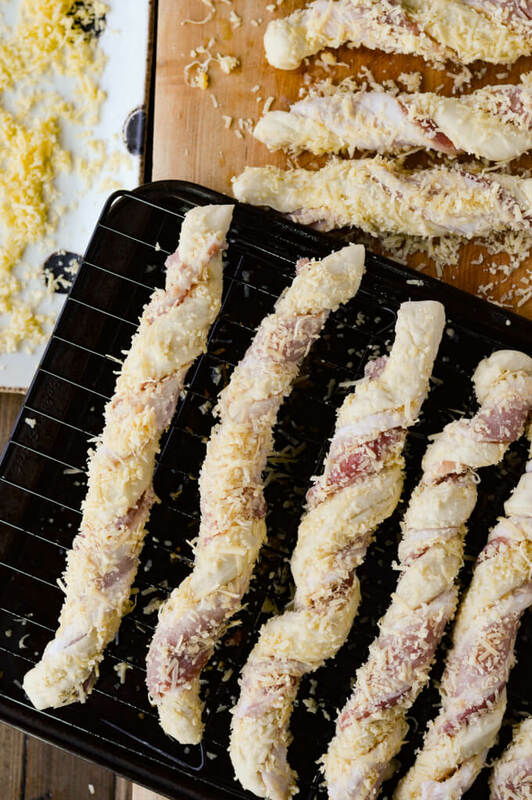 Basically, lay a strip of dough down, lay a strip of bacon on top, twist, and roll in shredded cheese. It’s that simple. Then they’re out of the oven in 25-30 minutes. 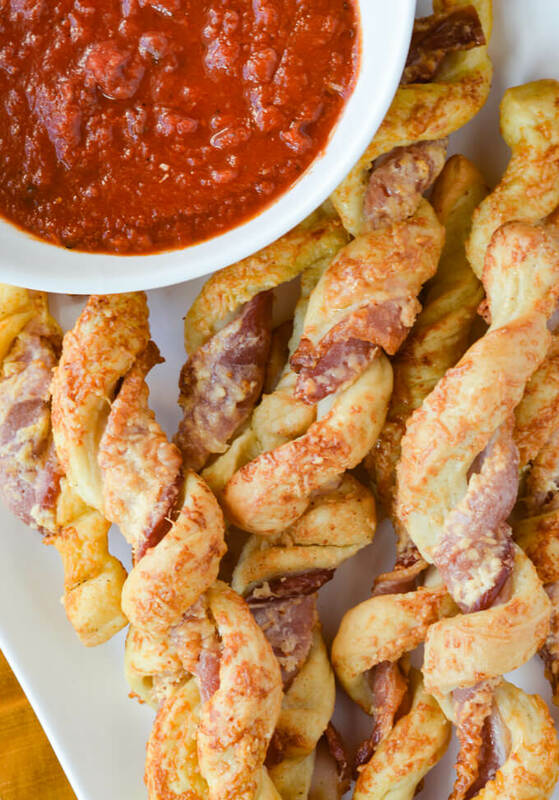 These Bacon Wrapped Breadsticks are the quintessential party appetizer. You can either serve them piping hot straight out of the oven or sitting out at room temperature. 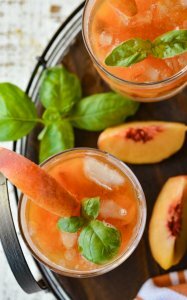 You can make a bunch at one time and make them ahead of time as well. 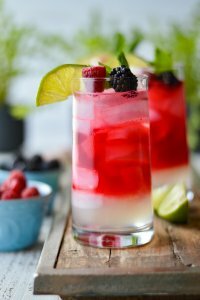 Anything to make your job as party planner easier is what you should go for. And these are the real deal. Start with a pizza dough that is both crispy and chewy. 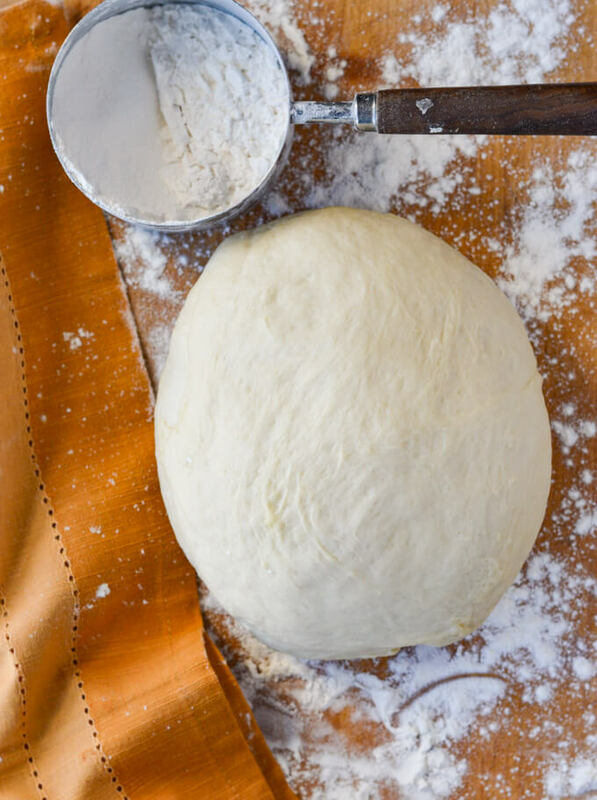 The foundation of this recipe is the pizza dough and I have the best one for you right here. The dough takes a little bit of time to knead, rise and roll out. But let me tell, it’s all worth it in the end. With this same dough, you can make two gourmet pizzas that are to die for – Chicken with Raspberry Jalapeño sauce (dang it’s good) and a Mediterranean pizza with Lamb Meatballs and Pesto Sauce (makes my mouth water just thinking about it!). Take one of the balls of pizza dough from the recipe above and roll it out in an oval/rectangle shape onto a lightly floured surface. A pizza cutter works great when cutting this dough into strips. Once you’ve rolled out the dough cut it in 12 long strips. Lay a piece of bacon on top of each strip then “twist and shout … work it on out” (that’s a song in case any of you are too young). Okay, well just twist. Twist in opposite directions from both ends until you get a nice candy-cane look. You want the bacon and the dough to basically be the same length when starting. By whatever means you want to achieve this, either by pulling the bacon longer or scrunching the dough shorter. What type of bacon is best? When picking out the type of bacon you want to use, go for the thick center cut bacon. Thick – why would you wrap it in bacon if you can’t taste the bacon, right? And center cut, because it’s meatier with less fat, therefore it doesn’t shrink up near as much. Brush the breadsticks with butter. 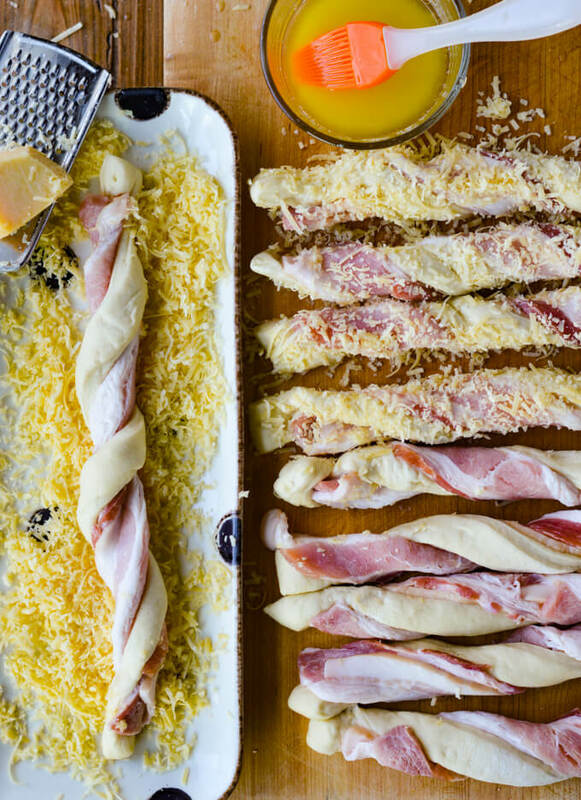 In order for the shredded cheese to stick well to the bacon wrapped breadsticks, you’ll want to brush them with melted butter. This is another added benefit to this recipe. 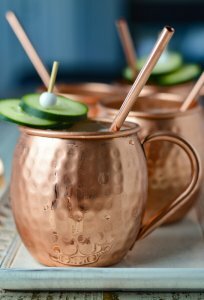 Okay, so it’s not the healthiest one you can make, but who’s counting calories when watching the Super Bowl? Brush on the butter, then roll in the shredded cheese. It’s that simple. Roll the breadsticks in shredded cheese. This is the cheesy aspect of these amazing appetizers! I thought I had parmesan in the fridge when I was making these but it ended up I only had smoked gouda. Which BTW turned out to be spectacular. In reality, you can use whatever type of cheese you want. I just would stay away from the soft type cheeses. I think Gouda is considered a semi-soft cheese, but it worked for me. Next time I’ll probably go with parmesan. But hey, play around with whatever you like. Use a wire rack over a cookie sheet. I used a cookie sheet with a wire rack on top so that they would cook evenly on all sides. I should have used foil or parchment paper under the rack, but of course, I didn’t because I want a good photo. It was quite the cheesy crusty mess to scrape off the pan. So you may want to learn from my mistake. In the oven and out in about 30 minutes. These little beauties went in a 400°F oven for about 25-30 minutes. What you’re looking for is a nice golden brown crust, bacon that is crispy and cheese that is not burnt. You’ll notice in the pictures the bacon still shrunk up a bit but it’s okay because I still got bacon in every bite. 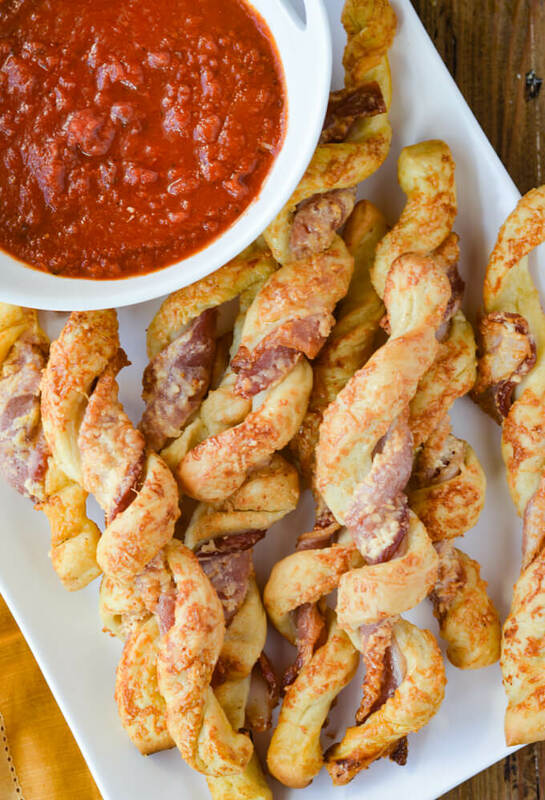 These Cheesy Bacon Wrapped Breadsticks would not be complete without dunking them into your favorite marinara sauce. My recommendation, when serving at a party, would be to fill small plastic appetizer cups and let your guest have their own individual serving. This removes any possibility of “double dipping” which is a party no-no! Bacon and bread belong together like peanut butter and jelly or macaroni and cheese. There’s a happiness that exists around the two of them when combined. 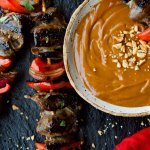 I think you will find this to be one of the most tempting and comforting appetizers around. Let me know what you think by leaving a comment below. Crispy. Chewy. Cheesy. 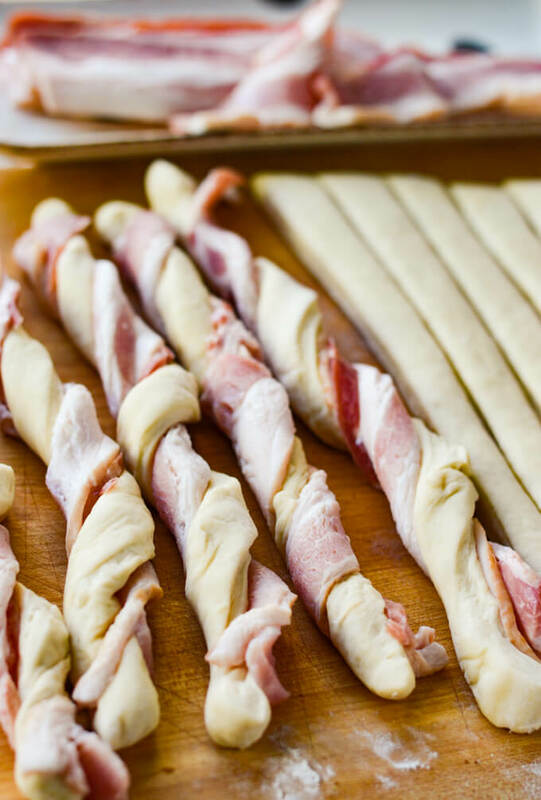 These Bacon Wrapped Breadsticks will be the hit of any party you throw. It starts with homemade pizza dough, adds a twist of bacon and is rolled in shredded cheese. It is truly an indulgent appetizer your guests will devour. 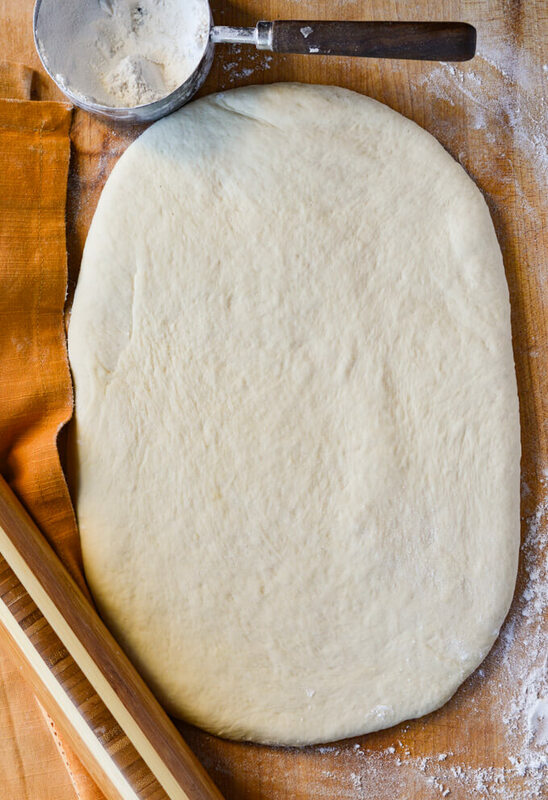 Roll out the ball of homemade pizza dough to an oval/rectangular shape. Using a pizza cutter, slice the dough into 12 strips. A pizza cutter works great for cutting the dough into strips. Twist in opposite directions from both ends until you get a nice candy-cane look. You want the bacon and the dough to basically be the same length when starting. When picking out the type of bacon you want to use, go for the thick center cut bacon. The center cut bacon is meatier with less fat, therefore it doesn’t shrink up near as much. A harder cheese like parmesan works best but you can use whatever type of cheese you want. I just would stay away from the soft type cheeses. Use a cookie sheet with a wire rack on top so that they would cook evenly on all sides. Lining the pan with foil or parchment papers makes for easier cleanup. What you’re looking for is a nice golden brown crust, bacon that is crispy and cheese that is not burnt. 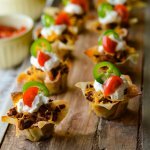 Fill small plastic appetizer cups and let your guest have their own individual serving. This removes any possibility of “double dipping” which is a party no-no! Well aren’t these spectacular!!! I can’t think of anyone who wouldn’t like these! Thanks! Awwww! Thanks so much Mimi. These definitely are quite addictive. Thanks for stopping by.